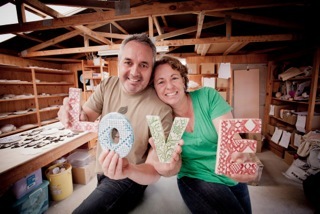 Borrowed Earth is fabulous creative couple Adele Robinson and Richard Butterworth. Their boutique ceramic studio is based in Auckland "Our passion for designing and making pottery is strongly influenced by our Maori and Pacific Island family history and our contemporary concepts of caring for the environment. The handmade pieces we produce in our studio uniquely combine the disciplines of art, sculpture, design and architecture."